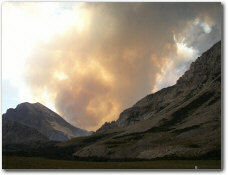 Montana's beautiful summers come with the increased incidence of wildfires. MDT doesn't often close roads, but when the safety of the traveling public is in question, traffic is detoured to an alternate route. Visibility due to smoke, fire fighting activities, proximity of the fire to the road, and increased movement of animals are some of the considerations that are taken into account when closing a road. Conditions can change quickly. For the most current information on road closures and emergency travel due to Montana wildfires, please see the Incidents/Closures Report. View the Red Flag Weather Warning to see if hazardous fire weather conditions are present.